Remix Meetup 9-10pm. Show n share your remix works. 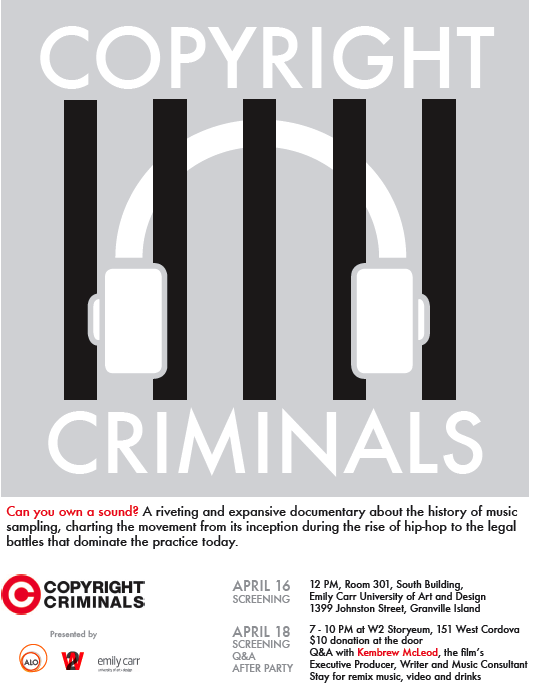 Copyright Criminals is a riveting and expansive documentary about the history of music sampling, charting the movement from its inception during the rise of hip hop to the legal battles that dominate the practice today. Artists’ Legal Outreach (ALO), W2 and Emily Carr University will present two screenings of this work, April 16 and 18, with the film’s executive producer Kembrew McLeod taking part in a post-screening Q&A at the April 18 event. Q&A with Kembrew McLeod, the film’s executive producer, writer and music consultant. Stay for remix music, video and drinks. This documentary traces the rise of hip-hop from the urban streets of New York to its current status as a multibillion-dollar industry. For more than thirty years, innovative hip-hop performers and producers have been re-using portions of previously recorded music in new, otherwise original compositions. When lawyers and record companies got involved, what was once referred to as a “borrowed melody” became a “copyright infringement.” The film showcases many of hip-hop music’s founding figures like Public Enemy, De La Soul, and Digital Underground—while also featuring emerging hip-hop artists from record labels Definitive Jux, Rhymesayers, Ninja Tune, and more. It also provides an in-depth look at artists who have been sampled, such as Clyde Stubblefield (James Brown’s drummer and the world’s most sampled musician), as well as commentary by another highly sampled musician, funk legend George Clinton.